What colors do Labradoodles come in? Here at Rainmaker Ranch Labradoodles we have DNA tested for all labradoodle colors. To meet all the possible color and size needs of our families we try and ensure a color mix every year along with a range of sizes even in our small program. Again, temperament and family personality fit should come first when selecting a dog. We suggest you stay open, meet all the puppies and select based on multiple criteria. 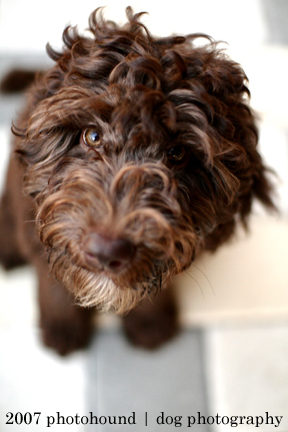 What is a parti labradoodle? 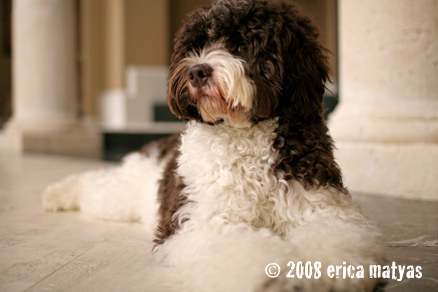 Parti labradoodles are two color dogs. They are white and any other color and are supposed to be about 50% white and another color. Genetically the dog is the color, so a black and white parti labradoodle is technically a black labradoodle that expresses parti. The parti portion is the white coloring over the other color much like a swiss cheese pattern allowing the other color to come thru. 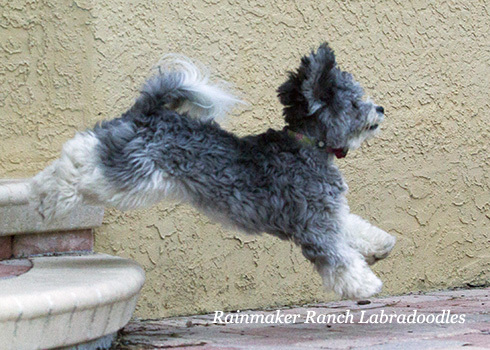 Please remember there is no accommodation at Rainmaker Ranch Labradoodles for a specific parti pattern you may want based on their photos over the first 8 weeks. We will continue to place all parti puppies based on color and gender and not on where that color pattern is located. 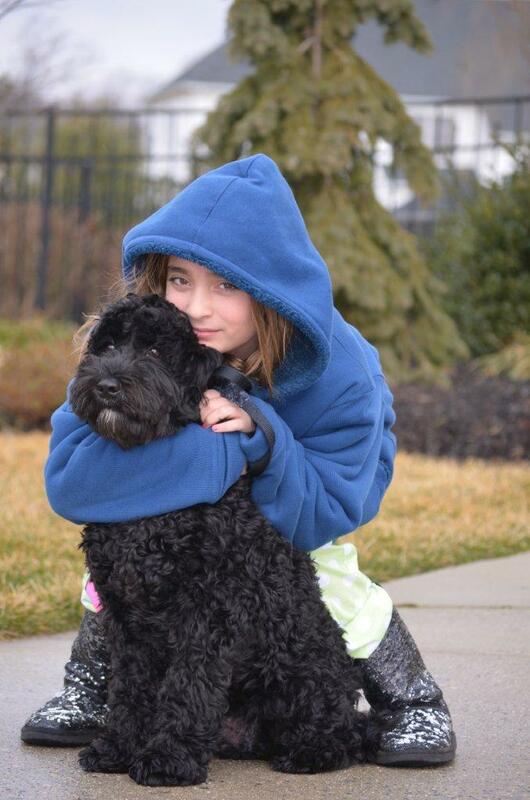 Our mission to provide the best puppy based on temperament and health to each family. We understand that families may have a preference in pattern as the puppies grow, but we want you to understand each puppy has a unique personality based on the temperament testing we run weekly. In turn, that temperament testing matches one family profile better than another. We only accept families to our wait list that also have the same goal of obtaining the best puppy based on temperament over pattern placement. At this point our puppies have a generally consistent middle of the road personality which is what we have spent the last 15 years breeding towards. However, even within that middle of the road personality (not too shy and not too rambunctious) we note difference which leads one puppy to be better with kids, or other dogs, or cats or the retired couple over the family with kids or traveling often. We will not alter this plan based on your position on the wait list or any other reasons other than personality match to a family profile. Please remember we cannot know which puppy might lighten over the years (Chocolate to café or lavender and Black to silver). IF one of the parents of your puppy is silver, café, or lavender the puppy may or may not change in color. This is a series of alleles within genes that may or may not be transferred to your puppy from his or her parents and may or may not be masked by other genes. In a nut shell, it is impossible to determine reliably at 1-8 weeks of age. We only accept families to our wait list that also have our goal of obtaining the best puppy based on temperament over the coat lightening possibility. IF you want a puppy that 99% will not lighten your best bet is to go to another breeder or select parents who have not changed in color and their parents have not changed in color. Please understand we think health and temperament is the most important criteria in selecting a puppy. So when is black not exactly black, well when you have Black Silk. When you have the perfect fleece coat, not too curly like a poodle and you have removed the harsher texture, you finally achieve Black Silk. Black Silk is super shiny. Think of it like paint sheen, you have gloss paint and flat paint, well Black Silk is like gloss paint. The color maintains this shine unlike some of the other colors, it is really quite beautiful and although black is genetically common, Black Silk is rare. Pictured is a Black Silk Australian Labradoodle Puppy and below an Black Silk Australian Labradoodle Adult, just beautiful! This link will take you to more photos of Sable and Brindle puppies and dogs. 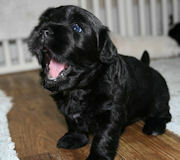 MORE PHOTOS, this link will take you to photos of our puppies as they grown up and colors may change.